Stage lighting is one of the most important parts of a theatre production, but often it’s overlooked until the last few weeks before opening night. This is a big mistake because lighting plays an essential role in creating the atmosphere for individual scenes and the overall play or musical itself. Used effectively, it can be just as important as the music or your set design. Here are a few stage lighting basic tips to get you started. Colour has a great psychological impact when it comes to conveying the emotions of your characters and the undertones of your plot. It’s good to do some research to find out what moods different colours create. Red, for example, is often used to signify danger, anger or passion. Yellow signifies fun, intellect and creativity; while blue is generally used to depict peace, honesty or calmness. Coloured bulbs or gels (pieces of coloured plastic which act as filters) can be used to create different lighting effects. There are three primary colours that you can use alongside your white light: red, yellow and blue. You create the colours you need by mixing these coloured lights. It’s worth considering the direction of your lighting. This helps you to create a pleasing composition on stage. When you plan the direction of your lighting, you’re also deciding where you want to draw your audience’s eye. Lighting your stage from the front, perhaps with spotlights, increases visibility and makes colours on stage look brighter and more vivid. Downlighting, on the other hand, adds a sense of depth and is useful for emphasising individual characters. Lighting can divide the stage up, highlight the main actor in a scene and help you to tell your narrative. If you need a broad general beam that illuminates a wider area, you can use equipment such as par cans or LED stage lights. Beginners will be pleased to learn that these are some of the easiest lights to handle and work with. When planning your performance, you also need to take into consideration the need for lighting trusses and theatre winches, and how you plan to control the lighting. 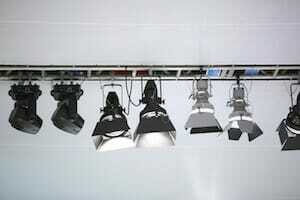 If in doubt, it’s wise to seek advice from someone who has experience with the technical aspects of theatre lighting. Above all, remember that when you are planning and designing your lighting, it’s all about enhancing the visual experience for your audience. Choosing the right lighting will help your play shine on opening night.